Charged and eager for his debut season in the highly competitive FIM World Supersport Championship is 2018 European Cup winner, Rob Hartog. For 2019 the rider from the Netherlands will take to the track once more under the familiar banner of Team Hartog - Against Cancer, but this time with a new title to chase. In a unique position within the Championship paddock, as true Privateers are few and far between, a lot needed to be accomplished in a short time by Hartog; all between Rider Entries getting approved by event organiser Dorna Sports and the season beginning. The hard work has paid off, however, with the team proud to confirm their plans for 2019 - with number #47 securing his World Championship start. 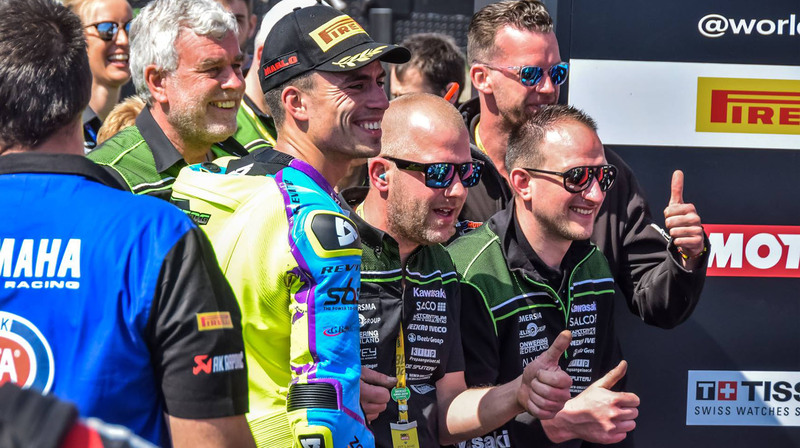 Last year was an exceptional season for Team Hartog - Against Cancer and the highest reward possible for the Dutchman’s consistency and commitment came during the series closer in Magny Cours, when Rob Hartog won the European Cup title. The winter break has been no vacation for the team though, and in recent months Team Hartog have fought hard to obtain the necessary budget to complete a full season of racing on the World stage. Thanks to the support of loyal sponsors, new partnerships and an encouraging crowdfunding campaign, the Dutch team have finally realised the dream - one that could not have succeeded without such unwavering support. The commitment from those that have already contributed so much also gives Team Hartog the confidence to close the last few financial gaps over the coming months. Abbekerk’s star rider will race the 2019 season aboard his trusty Kawasaki ZX-6R, with work going on nonstop behind the scenes to further improve the bike’s technical package - partly with thanks to the support of team partner Technomotion. In addition to the mechanical improvements, World Championship contenders are all obliged to fit a brand new electronics package in 2019, a situation that Team Hartog believes they can use to their advantage. With everyone under the same pressure to adapt to the different setup, it opens the way for riders like Hartog to gain precious momentum in the initial stages of the championship. The coming racing season now starts earlier than usual for Team Hartog, with the FIM World Championship kicking off at Phillip Island in Australia, February 22-24. Rob Hartog: "Team Hartog are very proud that we can announce this World Championship start. It is a dream come true - not only for me but also for the rest of the crew. For years we have worked hard to realise this situation, and the fact that it has finally arrived is fantastic! So many people have pledged their support in the crowdfunding campaign, and many loyal sponsors have taken a step up to help even more. Also, we have had to the opportunity to welcome new partners to our team. We are very grateful to everyone for this! We are not quite there yet and will, therefore, continue to work hard in the coming months, but we have every confidence that we will eventually be able to complete the job we started." The team are all one hundred per cent behind getting a good result, and we are looking forward to starting at Phillip Island in February! It is a busy period now because the season starts about two months earlier for us than in recent years. The crew, consisting of Technomotion, 2wielerservice Groenenberg, Rob Leek, Jan Visser and Gerard Kollis are therefore hard at work to prepare everything in time for our first test in Jerez on January 23-24. After that, our equipment must be packed up to fly to Australia on February 4. I am confident that we will start with a strong package in the coming season and that we will be able to take another step compared to 2018. Last year, I was eighth in Assen. This year I want to improve again and score a top-five finish. Overall our goal is to have a top-ten position in the World Championship. We're going for it! " Team Hartog rider Rob Hartog faced a barrage of emotions in his return to the World Supersport paddock after the FIM World SBK Championship recommenced at the Algarve International Circuit, Portugal. From a difficult Friday & Saturday to an incredible Sunday race, including a crash on the ultimate lap and red flag finish, Team Hartog were on top of the world, before an uncompromising decision from Race Direction saw the day end with a DQ and zero points. From Free Practice, the race pace of the Kawasaki ZXR-600 and rider duo was in serious doubt, with Hartog not managing to find his rhythm on Friday in Portimão; where he had, in fact, achieved solid results in recent years. Although many World Supersport riders had taken time during the Summer break to test on the beautiful Portuguese circuit, Team Hartog started the penultimate round without such an advantage. However, a firm lead in the FIM Europe Supersport Cup put him in good standings to take out the Championship. In FP1 the rider from Abbekerk put together a strong session, but the long break from the rigours of the World Championship took a toll on Team Hartog both on the circuit and in the pit box, converting into less than ideal lap times. Saturday's FP3 began with confidence that overnight improvements to the Kawasaki would give Hartog the required pace, however by the end of the session it was clear that times were not improving as quickly as anticipated. Under the heat of the Portuguese sun, Superpole 1 (First Qualifying) was held on Saturday afternoon, with Hartog finding additional troubles in his first stint on track and an early return to the Pits. For the second half, the Dutchman could not make the necessary adjustments and would end Q1 no higher up the timing sheets than P9. After yet another difficult day trackside, the rider from Abbekerk qualified in 19th for the Round 10 main event but the entire team were determined to do everything to get to the points. Working well into the pre-race evening, Team Hartog were fully behind placing their rider in a competitive position come race day. As the red light went out on Sunday, Hartog secured a phenomenal start from his spot on the seventh row of the grid, taking three places - and ensuring he was ready to cement his win of the European Championship. The Flying Dutchman then had his work cut out for him in locking onto a large group of riders in the running for the sixth position. Despite the difficult odds with his P19 start, Rob Hartog managed to move into an evenly matched battle for an incredible eleventh place finish after 17 laps of racing. It was an unlikely crash on turn 11 with another rider though, that saw the Dutch riders' advancement prematurely cut short. Even after picking up his Front Row Components Kawasaki and rejoining the track, Hartog's incident with Spaniard Quero Martinez was cause for a Red Flag. Rob Hartog was already in parc fermé as the winner of the European Cup Championship when the team were informed by the organization that he had been removed from the results. However, Hartog has retained his lead of sixteen points in the FIM Europe Supersport Cup with one more thrilling race at Magny Cours on the program in two weekends' time. A new track bought a new challenge for Team Hartog - Against Cancer rider Rob Hartog at the weekend, with Round 7 of the 2018 FIM World Supersport Championship held at the Automotodrome in Brno. However results speak volumes, and the Dutchman left on Sunday with a top 12 finish and a fistful of points. A hard week had already been spent rebuilding Hartog's Kawasaki ZX-6R with Front Row Components after the high-speed crash during Round 6 at Donington Park saw the Supersport machine written-off. Fortunately, with Hartog unhurt, the work was duly rewarded when he claimed the next race eleventh at the chequered flag. The World Supersport race started from the fifth row on the grid for the Dutch rider - with a satisfactory precedent on lap speed set by Saturday's Qualifying Sessions. Hartog had, in fact, the race pace to fight for a spot amongst the top ten riders in Brno, but lost precious seconds in the opening stage to be on the back foot and fighting to catch up. Close to qualifying amongst the fastest twelve of Superpole 2, Hartog first showed his speed again during warm-up on Sunday, and it was only due to an uncharacteristically slow start as the lights went out that saw the Abbekerk native play catch-up and battle it out with amongst the pack as he fluctuated between P13 and P16. After six laps of the Czech circuit, Hartog had P13 in the bag and could set his target on World racers Hannes Soomer and Hikari Okubo to take P11. The Netherlands rider was successful in his mission, but with a 5-second gap between himself and tenth, it turned into an uphill battle with not enough laps left to complete the task. Hartog managed to retake a few seconds from the deficit before the chequered flag and instead secured second place for the ESS Cup and eleventh fastest overall. Not completely satisfied with this result, as impressive as it is in the fierce competition that is the Supersport Class, Brno was the first race of the season at which Hartog had not graced the top step of the ESS Cup podium. The win this time around went to Eemeli Lathi, who finished the WorkdSSP race in 9th position overall. Team Hartog now have 24 points and are thirteenth on the World Supersport Championship ladder. With a 13 point lead over Lathi in the ESS Cup standings, it will be Hartog's goal to ensure he is back on the top step where he belongs come Round 8 in Misano, Italy. Rob Hartog: "The start was not super, but I was able to maintain my starting position. However, on the third lap, I was attempting to overtake a rider and went wide, losing three places. I was then working from where I started, and it took a lot of time. It was also difficult to overtake, and it was only once I had an open stretch in front of me that I could ride faster. From P11, I came much closer to the rider in front - I had the pace, but the race was just too short for me to overtake him. It came down to losing so much time in the initial phase, and it was a real pity that I couldn't make it back quick enough. We managed to limit the damage to the Championship by taking five points, but lost two in the European Cup." 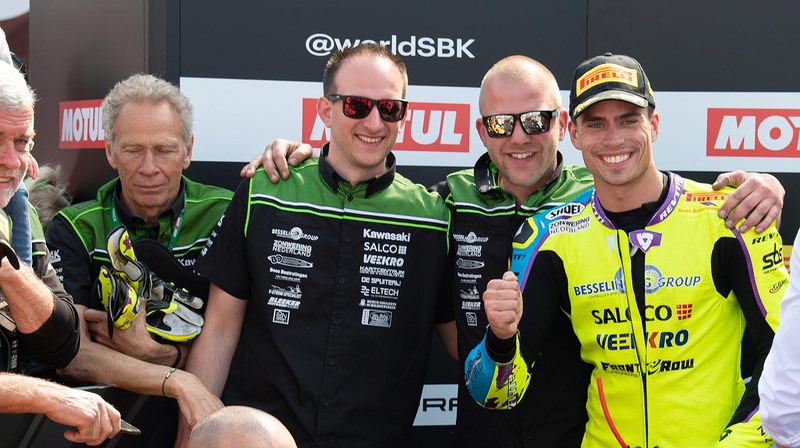 Team Hartog - Against Cancer - rider Rob Hartog has not reached the finish for the first time this season after a fierce battle saw the Dutchman down with only five laps remaining of the Prosecco DOC UK Round for the FIM WorldSSP Championship at the weekend. Unharmed but understandably disappointed to be out of Round 6 points contention, Hartog walked away from the highspeed crash that saw his Kawasaki ZX-6 destroyed. While battling for P13 after starting Sunday's race from the sixth row on the grid, the rider from Abberkerk lost control of his motorcycle - making Donington Park a problematic weekend two years running for the talented top ranker of the European Supersport Cup. The English circuit was soaking wet on Friday morning at the start of the first free practice; however, Hartog commenced the session well on board his Kawasaki with Front Row Components. At the beginning of the second stint, things began to go awry for the Dutchman though, and Hartog crashed in his first flying lap. Fortunately, there was little damage to both the rider and the bike - with the afternoon's track time utilised instead to master the narrow circuit. Hartog regained his composure to record a twelfth fastest time in the wet/dry conditions and narrowly missed out on a direct qualification into Superpole 2. During Superpole 1 on Saturday morning, Hartog was unable to show the pace of Friday's free practice and although there was some improvement the final sector was challenging for the Dutch rider with a small mistake seeing him land in P17 for the Round 6 race. Not at all convinced that Saturday's qualifying time was the limit of his potential at Donington Park, Sunday morning in the warm-up saw Hartog able to demonstrate that his pace was stronger and was sitting back in eleventh fastest overall by the end of the session. After another great start as the lights went out, Hartog only required ten laps to catch up with a large group of riders vying for ninth. After passing current season rival Luke Stapleford for thirteenth, Hartog was hard pressed to close a gap of over one and a half seconds to the riders ahead while he simultaneously battled alongside Brit Kyle Smith. During a heated attempt to gain some distance on Smith, the 26-year-old Dutch rider had his unsavable high side. Although the Europe Cup contender walked away from the British Round without WorldSPP points, Hartog still holds on to a top 15th placing within the Supersport Class of the World Championship. Team Hartog - Against Cancer's rider scored points during the first three races of the season with a tenth, eighth and eleventh place respectively in the European rounds - which means the young man from Abbekerk has a current lead of fifteen points for the FIM Europe SuperSport Cup. In two weeks time, running from June 8 to June 10, the FIM WorldSSP Championship will be held at the Automotodrom Brno, with the Acerbis Czech Round delivering a new circuit for the Netherlands native. Rob Hartog: "In the first corner I could see I had a bit of a problem being so far back in the group. But then it went pretty well, and I was able to pass some riders. I arrived at P13 and tried to close the gap to the riders in front, but I was also fighting with Kyle Smith. I wanted more and gave too much when I came out of a fast corner, which caused the crash. Fortunately, I walked away, but unfortunately, the engine has a lot of damage. Of course, the team would have preferred to go home with points, but something like this can happen to anyone. Wounds licked, and in two weeks we'll be back at it in Brno!" 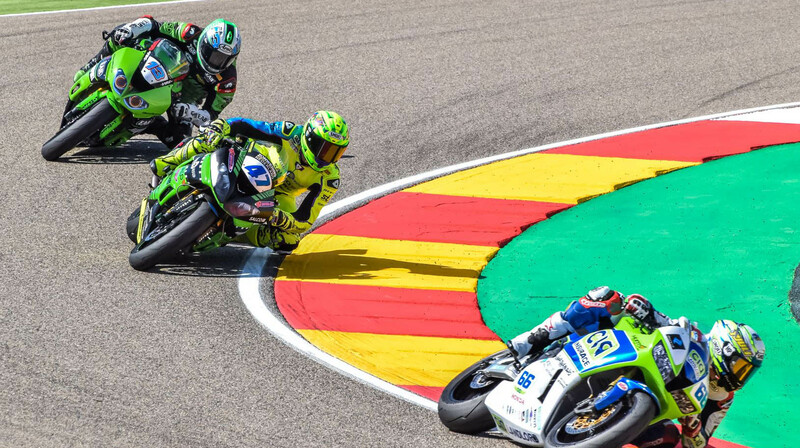 Rob Hartog (Team Hartog - Against Cancer) finished up a hot and heady Italian Round with an outstanding 11th place finish for the FIM World Supersport Class in Imola at the weekend. The Dutch native was to start Sunday's World Supersport race from the second row on the grid after a well crafted Superpole 2 qualification during unpredictable weather conditions. From fifth place, Hartog had an excellent start and had already jumped ahead one place into P4 as the race entered the first corner. After a long fought battle amongst the top-five, Hartog retained the pace until the mid-pack pushed up the tempo in the final laps and Team Hartog - Against Cancer's rider met the chequered flag in P11. Rob Hartog scored a 12th fastest time on Friday after two Free Practice Sessions; missing out on moving directly into Superpole 2 by just two-tenths. On Saturday morning, the Kawasaki rider had some concerns with engine adjustments and did not complete a quality third Free Practice on the Italian Circuit. However, modifications made in time for Superpole 1 Qualification meant that Hartog regained his confidence on the Kawasaki ZX-6R with Front Row Components. Settling back into the robust pace set by intense competition, Hartog's lap time rocketed the young rider to second place in the session and enabled a move through into Superpole 2 for the second time this year. The second part of Saturday's qualification became an intense waiting game, as rain left riders undecided over track conditions. Requiring a well-placed sprint very early in the session, Hartog flew through his second lap to land in P5 overall. During lap three rain began at the circuit in earnest, and meant that the cool-headed rider had successfully earned his career-best start position for Sunday's main event. Having now scored Championship points for the third time this season, Hartog remains undefeated in the FIM Europe Supersport Cup. With another five points to his name, the 26-year-old from Abbekerk sits comfortably in 12th place overall within the World Championship standings and is already 15 points ahead of the FIM Europe Supersport Cup number two rider. In two weeks we come to the mid-way point of this thrilling 2018 season - with the next round to be held at Donington Park, United Kingdom. Rob Hartog: "I tried to make a good start to the race, and I knew I succeeded because I was fourth into the first corner. But I also knew that front runners would be faster, so I tried to get into my own rhythm. Until the middle of the race it went well and I fought for fifth place. In the final phase I unfortunately could not keep my pace and dropped to eleventh. Overall we can be satisfied with the weekend. We have shown that the speed is there, and we have got great results in the European Championship!" 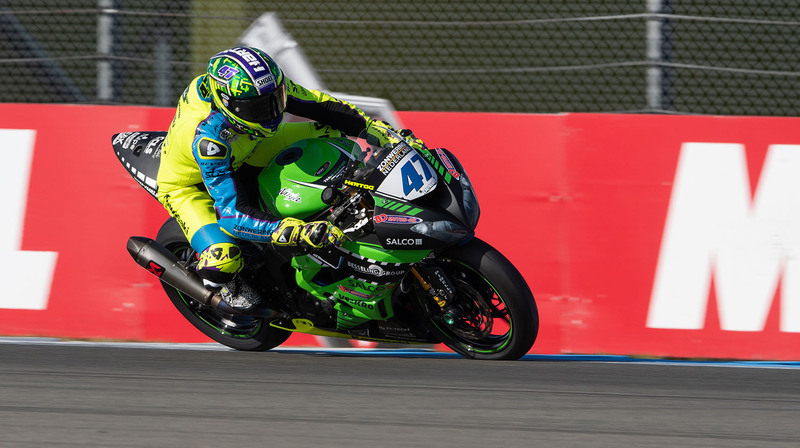 A fantastic weekend for Rob Hartog (Team Hartog - Against Cancer) saw the rider from the Netherlands send his Kawasaki ZX-6R to an impressive top ten finish in the FIM World Supersport race at the TT Circuit Assen. Round two also saw Hartog secure back to back victories for the 2018 FIM Europe Supersport Cup. The rider from Abbekerk started the Dutch race from eleventh on the grid after an intense day of Free Practice and qualification with a ninth fastest time after the Friday sessions -giving him the right to participate directly in Superpole 2. It was a defining session for the young rider, as he clocked his first ever lap in the 1'38s on the Dutch track. Hartog had another excellent start as the lights went out on Sunday, and was up three places by the first turn. The 26-year-old lost some race pace in an attempt to stick with the six fastest riders, falling back one position as Randy Krummenacher charged to the front. However, he ended the final stages of the 18 lap race well, fighting for eighth with Niki Tuuli and Thomas Gradinger. Due to a crash amongst riders in the leading group, Hartog fought for sixth in the final stage, and the star from Abbekerk crossed the finish line in eighth to score his best result ever in the World Supersport. After two races, Hartog has already collected fourteen World Supersport points - sitting thirteenth overall for SSP. Rob Hartog: "I had a good start, and I found the connection early with the fastest seven riders. The first laps were good, but then I struggled to keep my pace. It was a nice, hard fight though. I thought a sixth-place finish would be in my favour during the last lap when I knocked out Tuuli in the GT corner. However, in the second kink, he cut the corner and took back the position. To get my best result ever in my home round though is fantastic! It is great to see how many people are here to support the local riders. I also want to thank the team because we all had a great weekend!" Finally, the season for Team Hartog - Against Cancer begins, after a heart-stopping opening round in Aragon at the weekend. The north holland native placed 16th on a grid of 28 World Supersport riders - which made the odds of making up more than a few places seemingly insurmountable. However, a solid start off the line was the fuel to Hartog’s fire, and the Dutchman fought from the third corner of lap one with nine other riders straight for the lead. Five laps into the thrilling 16 lap race, Hartog was only 2.5 seconds off the front-runner and still fighting to cement his spot in the top ten. With an eight position amongst the leading pack, the young Dutch rider managed to maintain his race pace in a group of eight that all drove hard for sixth place. Finishing Round 1 in tenth place overall, Hartog now takes the advantage on his Kawasaki Ninja as the current leader of the European Supersport Cup Championship after race one with 6 points. The 2018 ESS Cup rides again in conjunction with the FIM World Supersport rounds, where it is already the third race of the season. Last year Rob Hartog's season started on the Aragon circuit, with the Kawasaki rider scoring a neat twelfth place - but he also had the luck with a number of dropouts. 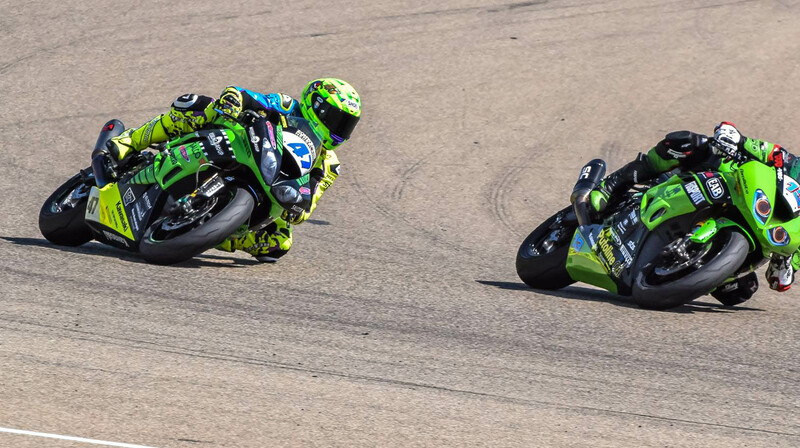 This year, after four days of productive testing in the off-season, Rob Hartog began the weekend at Motorland Aragon with plenty of confidence. Friday Free Practice 2 saw Hartog only 0.02 off going directly into Superpole 2. However, the eleventh placing lap time still put him in a top spot for Superpole 1. The 26-year-old rider managed to improve his time by three tenths in the session overall and put Hartog as fastest in the FIM Europe Supersport Cup after free practice and qualifying. It will be Round 2 to remember as the rider from Abbekerk finds his rhythm, and the thrill of the World Supersport competition continues next Sunday (April 22) with a home race at the TT Circuit Assen! Rob Hartog: "My start was great, and I had already moved into ninth place after the first lap. I was then able to settle well within the group of the top ten and was on the hunt to grab a few positions. Halfway through the race though, I was overtaken by three riders and lost the connection to the middle pack. In the end, I was just short of winning some more positions, but this tenth place is a great start of the season! 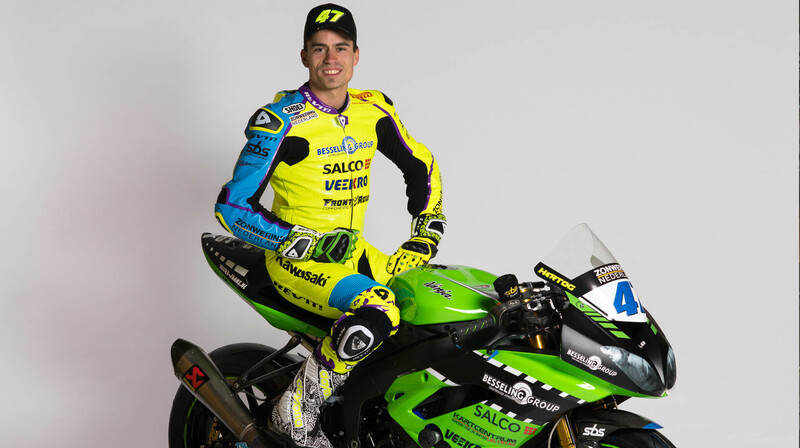 The team has worked incredibly well, and we are already looking forward to Assen!" Robin Duyzers (Crew Chief): "The new formation of the team worked very well. Rob made no mistakes, and the atmosphere in the team is great. Everyone worked hard for these results in race 1, and the result proves this. With two new mechanics, who have done their job well, it puts the team in a great position. The team are living for the next race weekend!" The MOTUL FIM Superbike World Championship season will join the Europe circuit in April, as round 3 for 2018 kicks off in MotorLand Aragon, Spain. It also marks the beginning of the combined European Supersport Cup. 2017 runner-up to the ESS crown was Rob Hartog (Team Hartog - Against Cancer), and Netherland's young gun is fully prepared for his next challenge. The racer from Abbekerk finished last season 10 points ahead of third-placed Italian, Alessandro Zaccone. However, one point stood between Hartog and top honours, with Estonian rider Hannes Soomer crowned the 2017 FIM Europe Supersport Cup champion. As Soomer (Team Racedays) has now made his move to a full-time spot in the World Supersport class, it puts Hartog in hot contention for taking this year's prize. Full grids and fierce competition are continually upping the ante on earnest track action between European contenders interested in the title. However, the North Holland native has already scored multiple top 10 finishes amongst the World Supersport class, and 2018 will be no exception. On the number 47 Kawasaki Ninja 600, Hartog has the advantage of strong local support; the Dutch are eager to see more riders on the World podium. Previously decided in Jerez, the 2018 European Supersport Cup will now wrap-up on September 30 at Round 11 of the MOTUL FIM Superbike World Championship in France - just before the World Championship leaves the EU for the more exotic racing locations of Argentina and Qatar. 2018 will be the 27th year a WorldSBK event has visited the Circuit de Nevers Magny-Cours since racing commenced in the French province circa 1991. 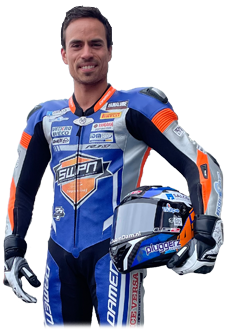 Rob Hartog, Rider, Team Hartog - Against Cancer : "After missing the ESS title on one point last year, we are more eager than ever to get going with the new season. We have had some great tests in the pre-season. It is going to be our second year on the WorldSSP Kawasaki, so we feel we know the bike now, and that gives us a lot of confidence for the start of the season!" Robin Duyzers, Crew Chief, Team Hartog - Against Cancer : "There are some new faces in Team Hartog this year, but the enthusiasm is there, and the atmosphere is excellent. Rob was determined during testing to reach race pace as quickly as possible - plus he listens and works hard to understand the bike. As a rider who is very smooth, along with Kawasaki's advantage on corner entry, from a technical point of view, it is the best we can hope for to build speed and confidence during races."